Many organizations offer services. We offer solutions. Our primary goal is the development of a strong network of literacy providers that offers high quality literacy services and assures the success of adult learners. Improving the quality and increasing the quantity of literacy instruction in and around Tarrant County is central to everything we do at Tarrant Literacy Coalition. We know that assistance to local literacy providers through the following objectives will ignite a passion for literacy, a commitment to resourcefulness, and a desire to serve more people effectively. Learn more about our mission by reading our story. The Institute for Literacy Development is a means through which literacy instructors are given the tools they need to exercise the power of knowledge to foster individual, economic, educational, and social improvement. 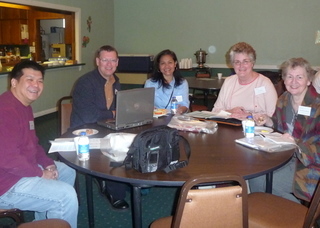 The Coalition welcomes all adult literacy programs to participate in networking and training events. Click to find support and new opportunities. Because of financial limitations, providers often lack the resources and organizational support needed to implement innovative instructional programs for adult learners. Our goal is to assist literacy providers in need by seeking out financial resources to help them help the students. Training for literacy staff and volunteers provides insight and skills to tackle some of the biggest challenges: assessing adults' progress, improving student retention, accommodating learning differences and disabilities, and addressing diverse learner needs. Without these tools, the effectiveness of a program will suffer. Low literacy saps the energy and capability of our community. Developing partnerships is one way to tackle the issue across multiple sectors. Reading is only one component of adult literacy. The ability to function on the job and the know-how to develop a career path are vital for the stability and growth of families and today's increasingly complex workforce. 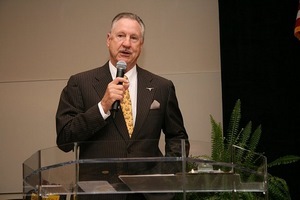 Former Fort Worth Mayor Mike Moncrief speaks at the Coalition's Corporate Spelling Bee. Click to learn more about this community-wide event that combines literacy awareness efforts and local businesses and organizations. Addressing low literacy is essential to lifting Americans out of poverty and building a stronger economy. Our goal is to include the entire community--business leaders, government officials, media, faith-based groups, community volunteers, educators, medical and legal professionals, adult learners, public and private funders and citizens of our community--in the discussion. Launching new programs and sustaining the momentum of current programs will require a significant financial investment. Failing to do so will cost even more. Funding enables programs to obtain much needed materials for classes, pays to to sponsor a student's GED® test, provides for training and technical support for instructors, and supports the recruitment and training of additional volunteers.